From Interstate 70 near Green River, the Book Cliffs are not showy: gray, dusty and forbidding, the rocky mass seems noteworthy only for its harshness juxtaposed against a naked blue sky. Proceed past this faÃ§ade, however, and the lush, pine and aspen-filled wilderness known as Bogart Canyon, largely untouched by man’s rough hand, reveals itself. Beloved by hunters and environmentalists, Bogart Canyon has beneath it what some believe are vast pools of oil that soon could be tapped and drained. When it comes to the 3.4 million acres of land that was handed over by the federal government to Utah’s schoolchildren at statehood, almost anything can happen—so long as dollar signs are attached. Some of the proceeds from all of these projects will trickle down—in the form of books, computers and even teachers—to Utah’s schoolchildren, for it is they who own the land. Few Utahns, let alone schoolchildren, know about the School & Institutional Trust Lands Administration (SITLA), an agency that has just one goal: to make money for the state’s K-12 constituency. In 2013, the work of SITLA manifested itself in around $40,000 for every school in the state. Utah’s cash-starved public education system needs the money, so criticizing how it’s won can be politically sensitive. 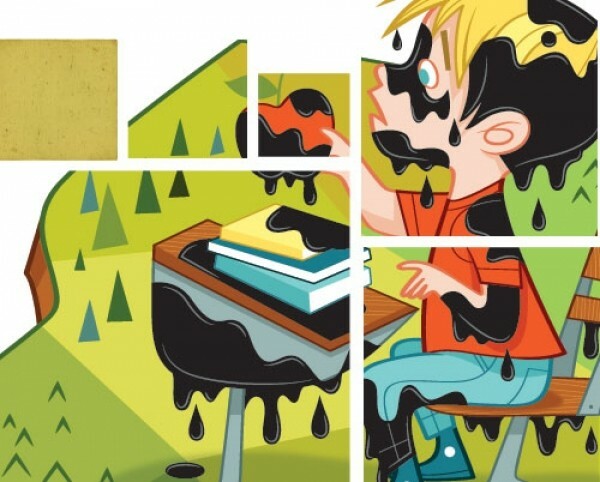 But as the impacts of Utah’s ever-growing population take their toll on the environment, SITLA’s quest for money has taken it to the feet of the energy industry’s most controversial and resource-intensive extraction methods, like oil shale and tar sands. And as the state’s air grows dirtier and water supplies dwindle, some question whether the good SITLA does for the schoolchildren of today is damning the schoolchildren of tomorrow. As effective as SITLA is at making money, its annual contribution to education accounts for only about 1 percent of the state’s $3 billion-plus education budget. The permanent school-trust fund, into which SITLA’s revenues are folded, holds $1.6 billion. The interest and dividends earned from this fund are funneled to the schools. In 2013, this came to $37 million, which was divided between all of the state’s public schools through a formula based largely on enrollment. Then it reaches elected school community councils, which decide how to spend it. Because of this delivery method, SITLA is often ascribed nothing less than savior status. Even though its contribution to education is small, it’s a resource that parents and teachers get to allocate the way they see fit. But it is here where the debate rages about whether or not the money SITLA provides to schools outweighs the damage its develop-first mentality causes to the land. Garbett, of SUWA, and many others interviewed for this story, expressed concerns that because SITLA has a single mandate—to monetize lands—it can’t benefit the schoolchildren of Utah in other ways. Garbett cited Bogart Canyon in the Book Cliffs, a premier spot for wildlife, as a location where something besides building up a bank account is possible. Ty Markham, a former teacher and co-chair of the Mormon Environmental Stewardship Alliance, also says SITLA’s monetary contribution to education is not worth the harm it brings to the state’s lands. To Bird and SITLA advocates, talk like this translates to nothing less than stealing books from schoolchildren. In Utah, many county commissioners, private companies, state employees and SITLA don’t try to hide, nor are they ashamed of, the fact that business goes off with fewer hitches when it happens on state or school-trust lands. Fewer hitches means less regulation—and less regulation means they don’t have to comply with the federal government’s environmental- review policies. Kim Christy, SITLA’s deputy director, said if his agency had to think about multiple uses, like conservation and recreation on trust lands, it’d be no better than the much-maligned federal Bureau of Land Management. One example of SITLA’s efficient business model is illustrated in the installation of cellular-telephone towers, 122 of which exist on school-trust lands. Although a telecommunications firm must obtain relevant county permits to install a tower on SITLA land, no federal environmental review must be obtained, as would be the case on BLM land. As a result, Garbett says, it makes sense that private companies of all makes and models would prefer doing business on school trust land. In the Uintah Basin, Utah’s nest of oil activity, SITLA’s sphere of influence looms large. According to Uintah County Commissioner Mike McKee, 8.2 percent, or 138,000 acres, of the county is managed by SITLA. For McKee, who notes his county has “generally had a favorable position toward the extraction industry,” the more land he can wrest from the federal government, which manages the vast majority of the county’s land, the better. Much of the activity occurring on SITLA lands happens in the Uintah Basin. This is by design. Since 1998, SITLA has traded out 499,481 acres of its land near sensitive wilderness areas for plots that can more easily be developed. The biggest single exchange involved 377,000 acres SITLA managed in the Grand Staircase Escalante National Monument. In exchange it received a large chunk of land near Price known as Drunkard’s Wash, plus $50 million cash. Since that trade, Drunkard’s Wash has netted $140 million for the school trust fund. Garbett says trades like these are largely beneficial for everyone involved. SITLA gets land in places like the Uintah Basin that’s rich in resources, while more sensitive land in wilderness study areas, for example, are protected. A current land-exchange effort, known as the Utah Recreational Land Exchange Act, will trade out 36,000 acres of SITLA land around Moab near the Colorado River for 46,000 acres of federal land in Grand, San Juan and Uintah counties.